The Physics Research Laboratory pursues the development and application of quantitative imaging techniques for the assessment of soft-tissue and bone structure and function using computed tomography and x-ray and radionuclide imaging. 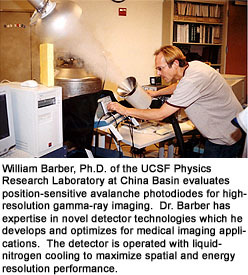 The laboratory also trains graduate students and postdoctoral fellows in biomedical imaging. Laboratory resources include a multimodality imaging platform, x-ray instrumentation laboratory, radiation detection and electronics laboratory, radiopharmaceutical handling/storage facilities, and preclinical microSPECT/CT and microPET/CT. We are constantly looking for passionate undergraduate and graduate students, medical students, residents, and fellows from UCSF, UCB, or other academic institutions who are interested in pursuing nuclear molecular imaging physics and instrumentation.